A simmering conflicto with the Kurds threatens to consume an American ally and inflame an already-unstable region. On the morning of Oct. 29, 2014, a long convoy of armored vehicles and trucks rolled northward in the shadow of Iraq’s Zagros Mountains and crossed a bridge over the Khabur River, which marks the border with Turkey. As the convoy rumbled past the border gate, the road for miles ahead was lined with thousands of ecstatic Kurds, who clapped, cheered and waved the Kurdish flag. Many had tears in their eyes. Some even kissed the tanks and trucks as they passed. The soldiers, Iraqi Kurds, were on their way through Turkey to help defend Kobani, a Syrian border city, against ISIS. Their route that day traced an arc from northern Iraq through southeastern Turkey and onward into northern Syria: the historical heartland of the Kurdish people. For the bystanders who cheered them on under a hazy autumn sky, the date was deliciously symbolic. It was Turkey’s Republic Day. What had long been a grim annual reminder of Turkish rule over the Kurds was transformed into rapture, as they watched Kurdish soldiers parade through three countries where they have long dreamed of founding their own republic. Some who stood on the roadside that day have told me it changed their lives. The battle against the Islamic State had made the downtrodden Kurds into heroes. In the weeks and months that followed, the Kurds watched in amazement as fighters aligned with the Kurdistan Workers’ Party, or P.K.K. — long branded a terrorist group by Turkey and the United States — became the central protagonists in the defense of Kobani. The P.K.K.’s Syrian affiliate worked closely with the American military, identifying ISIS targets for airstrikes. Nineteen months after that convoy passed, the feelings it inspired have helped to start a renewed war between Turkey and its Kurdish rebels. Turkish tanks are now blasting the ancient cities of the Kurdish southeast, where young P.K.K.-supported rebels have built barricades and declared “liberated zones.” More than a thousand people have been killed and as many as 350,000 displaced, according to figures from the International Crisis Group. The fighting, which intensified last fall, has spread to Ankara, the Turkish capital, where two suicide bombings by Kurdish militants in February and March killed 66 people. Another sharp escalation came in mid-May, when P.K.K. supporters released a video online seeming to show one of the group’s fighters bringing down a Turkish attack helicopter with a shoulder-fired missile, a weapon to which the Kurds have rarely had access. Yet much of the violence has been hidden from public view by state censorship and military “curfews” — a government word that scarcely conveys the reality of tanks encircling a Kurdish town and drilling it with shellfire for weeks or months on end. The conflict has revived and in some ways exceeded the worst days of the P.K.K.’s war with the Turkish state in the 1990s. The fighting then was brutal, but it was mostly confined to remote mountains and villages. Now it is devastating cities as well and threatening to cripple an economy already burdened by ISIS bombings and waves of refugees from Syria. In Diyarbakir, the capital of a largely Kurdish province, artillery and bombs have destroyed much of the historic district, which contains Unesco world heritage sites. Churches, mosques and khans that have stood for centuries lie in ruins. Tourism has collapsed. Images of shattered houses and dead children are stirring outrage in other countries where Kurds live: Iraq, Syria and Iran. The Turkish city Nusaybin sits directly on the long southern border with Syria, a faded cluster of stone and cinder-block dwellings where truckers often stop on their way eastward to Iraq. Driving by, you would scarcely guess that it has been an outpost and a battleground for a half-dozen empires over the past 3,000 years, from the Aramaeans to the Ottomans. It still contains Roman ruins and one of the Middle East’s oldest churches. It has been a Kurdish town since a century ago, when Christian residents fled southward from Turkish pogroms that started during the upheavals of World War I. Last summer, when the fighting broke out, Kurdish youth affiliated with the P.K.K. built barricades around several neighborhoods making up about half the town. The Turks initiated several short military operations during the autumn and winter, but the defenders kept them at bay with a mix of well-placed roadside bombs and snipers. I entered in early March with the help of a local activist, who acted as a translator and guided me as we drove along a winding road on the edge of town. 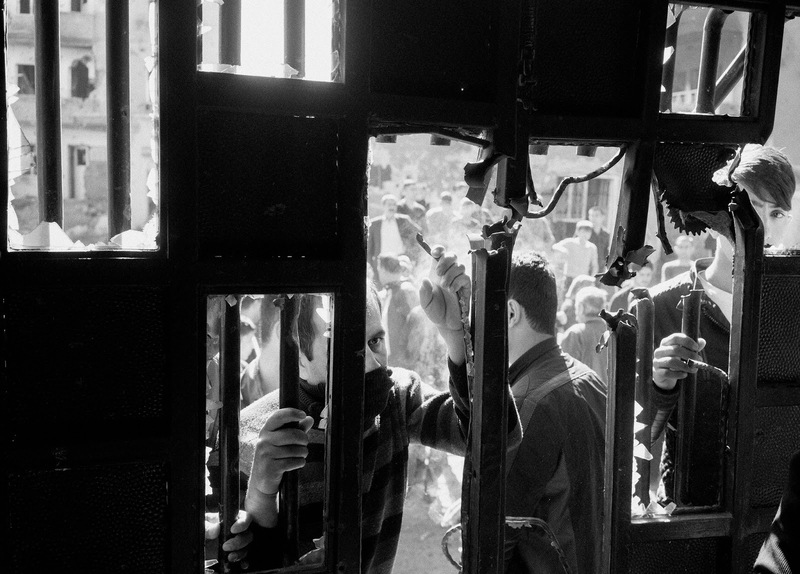 We had to carefully avoid army and police checkpoints; journalists are strictly barred by the Turkish government from reporting on the insurgency, and even the mildest expression of sympathy for the rebels can earn a prison sentence. As a result, what has happened behind the barricades and under “curfew” has gone largely unreported. We stopped near a bridge over a shallow creek with big holes blasted into it, the legacy of a car bomb several months earlier. The rusted carcass of an upturned water truck, riddled with bullet holes, marked the start of the insurgents’ territory. We walked around it, and after a block or so we reached the first barricade, built of paving stones. It was about six feet high and three feet thick. We soon passed several more; the streets had been torn up to build them and were now mostly dusty earth. The area seemed deserted, but at last we heard voices and emerged into a vacant lot between houses. A young man came out to greet us, wearing a tan vest and clutching a walkie-talkie. He led us into a half-open patio that once served as a garage, where other fighters and activists were slumped on battered old couches, chatting and drinking tea and smoking. They were all in their 20s, apart from a heavyset middle-aged woman who introduced herself laughingly, in Kurdish, as the “cook of the terrorists.” They wore rumpled clothes and gave off a relaxed, faintly bohemian air; they seemed more like leftist college students on a weekend morning than guerrilla fighters. They told me they had all been protecting what they called the “liberated zone” since the summer. Some grew up here and had families still living alongside them. Nineteen civilians and 12 fighters were killed during the fighting in Nusaybin, they said. On the walls were big posters of several of the dead, with their names and the word sehid, or martyr. One of them looked no more than 16, a kid in a soccer jersey with the sweetest of smiles on his face. Also on the walls were two big portraits of Abdullah Ocalan, the founder of the P.K.K., with his unmistakable log of a mustache and tussocky black eyebrows. Ocalan, a man of titanic ego who ruthlessly ordered the execution of rivals and dissidents, has been in prison on the Turkish island Imrali since his capture in 1999. He still lords over the movement — including its Syrian affiliate, the P.Y.D. — like an absent philosopher-king, issuing cloudy leftist declarations through his lawyers. 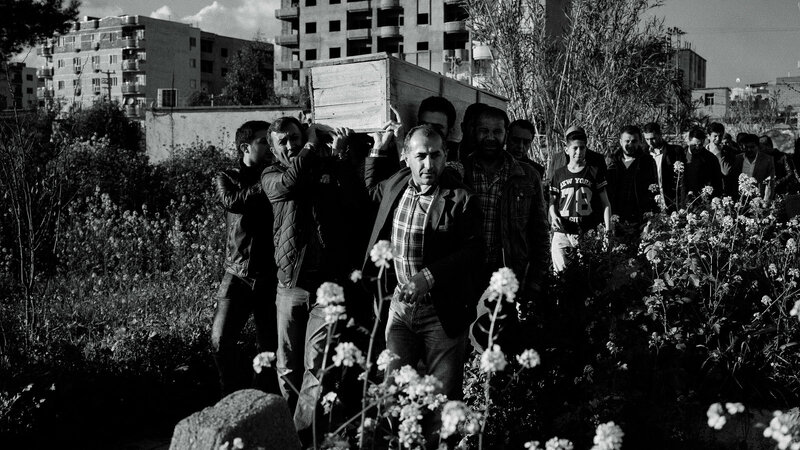 No one in Nusaybin had any illusions about what was in store for them. A few days earlier, the war’s realities burst into public view in Cizre, about two hours to the east. Cizre had been under curfew and closed to the outside world for almost three months, with tanks on nearby hillsides firing down on it. Few images had leaked past the military’s blockade until the town was declared free of terrorists and partly reopened, early on a Wednesday morning. I drove in with the first wave of returning residents. The damage was visible as soon as we passed the first checkpoint on the edge of town: Burned debris and shattered glass littered the main boulevard. Huge holes left by tank rounds gaped in the walls of buildings. Moving onward on foot, I followed the returnees into a residential district where the streets were half-blocked by piles of rubble. Roofs had collapsed earthward, the buildings’ innards — mattresses, curtains, chair legs — sticking out at odd angles. A weird silence reigned. I saw people clutch their faces as they found their ruined homes. Others sobbed or shouted curses. The founder of modern Turkey, Mustafa Kemal Ataturk, was bent on melding his fractious array of peoples into a single, homogeneous state. Starting under his rule in 1923, the Kurds, whose presence in the area goes back well over a thousand years, were rebranded “mountain Turks,” their language and customs suppressed. Kurdish schools, organizations and publications were forbidden; even the words “Kurd” and “Kurdistan” were prohibited. Hundreds of thousands of Kurds fled to western Turkey and Europe, and the southeast became a neglected backwater. The P.K.K. aimed to reverse all of this, preaching a reverence for transnational Kurdish identity and language under the banner of a secular, leftist program. Its war with the government has cost at least 30,000 lives since it began in 1984. The group’s leader, Ocalan, cleverly played on Turkey’s rivalries with neighboring states to gain refuge for his fighters in Iraq, Syria and Iran, which are home to about half of the Middle East’s roughly 30 million Kurds.. 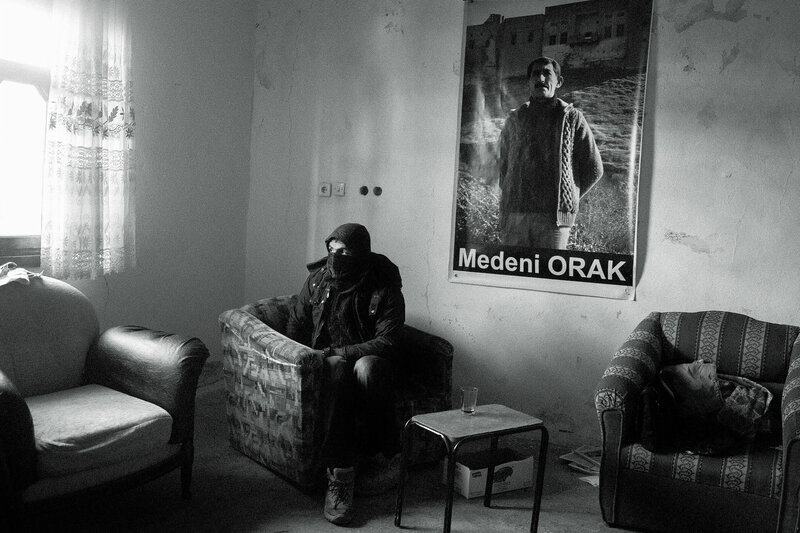 The Nusaybin rebels I met were mostly born in the mid-1990s, when the Kurdish conflict last crescendoed. One of them, a lanky 27-year-old with a lean, foxlike face, seemed startled when I asked about his childhood; I got the sense that no one had bothered to ask him before. He went by the nom de guerre Omer Aydin. He spoke quickly, hunching forward in his chair and steadily tapping his feet, his dark eyes glinting with a nervy, cheerful energy. He was born in a village near Nusaybin, the son of a farmer. His village was full of P.K.K. sympathizers, including his parents, who ardently supported the group’s vision for a Kurdish state, and would shelter and feed its armed rebels as they slipped back and forth from their strongholds in the mountains. The military raided Aydin’s village so many times — arresting young men, shooting up houses and animals — that Aydin’s father gave up and moved the family to an Istanbul slum. Aydin’s parents sent him to work in a clothing factory when he was 10. One day the factory boss overheard Aydin speaking Kurdish, the only language he knew, and rounded on him, shouting: “Never speak that language in here! You will speak Turkish.” Aydin told me he would never forget that. In those years, the Turkish military destroyed and evacuated thousands of Kurdish villages, creating a flood of displaced people. The state supported shadowy proxy groups like Kurdish Hezbollah (no connection to the Lebanese movement), which tortured and killed with impunity and fostered an atmosphere of terror. The P.K.K. responded with raids that killed hundreds of Turkish soldiers and police officers. Kurdish children born in the ’90s are known to their elders as the “youth of the storm.” They grew up with a legacy of anger. Tens of thousands were arrested as teenagers, and prison contact with P.K.K. members radicalized many. They are more likely to be unemployed than their non-Kurdish peers. And there are a lot of them: The bulk of the population in some Kurdish areas is under 20. Older Kurdish political figures often declare, in talks with the state, that they are the last generation the government can have a dialogue with; the next one, they say, is far more radical. It’s a pressure tactic, and it has become a talking point. It may also be true. By the time Aydin was in his teens, his father and all of his eight brothers had been arrested on charges of P.K.K. activity. So had many other relatives; one childhood friend was shot dead by Turkish soldiers in the mountains. Aydin had spent a total of four years in school. He learned Turkish there; he still didn’t speak it well. “When you are 15 or 16 years old, you are looking for something,” Aydin told me. “After what happened to my brothers, my father, all the arrests and the killings, I looked at my life and said: I should do something toward a revolution.” He joined the P.K.K. I asked him how it happened, and he grinned mischievously. “When there is a light in the dark, you will find your way to it,” he said. Aydin trained in the mountains, learning how to handle a gun, set bombs, evade capture and communicate with fellow members. He then spent a decade in a series of Turkish cities, mostly helping to recruit other young Kurds. This, too, is a mark of his generation. The Kurds were a rural people for thousands of years, but in the past two or three decades that abruptly changed, and most now live in cities. By 2014, the P.K.K. had ordered Aydin to Nusaybin. His primary task was to supervise the recruitment and training of young locals. These youth affiliates were given a new name: the Y.D.G.-H., which later grew into Y.P.S. (The P.K.K. is known for its love of abbreviations.) Many were only teenagers. At the time, there was some hope for an end to the conflict. After its high point in the 1990s, violence had lapsed under Erdogan, who quietly loosened restrictions on Kurdish language and culture after he came to power in 2002. He also promoted economic development in the long-neglected southeast. Many Kurds were moved and impressed when Erdogan said in a 2005 speech that “the Kurdish problem is not only the problem of one part of my nation, it is a problem of every one of us, including myself.” Progress was slow and halting, but after a cease-fire was declared in 2013, Turkish security forces largely withdrew from Kurdish cities in the southeast, softening old resentments. Some Kurds told me they felt free to walk late at night without fear of arrest for the first time. You could even wave a P.K.K. flag without receiving a jailhouse beating. Erdogan had long appeared to believe that peacefully resolving the Kurdish issue would bolster his reputation as a unifying leader and win more votes from Turkish Kurds. He needed those votes to accomplish a larger goal: revising Turkey’s Constitution to create a presidential system that would augment his own powers. To get there, he would need to offset the rise of a new Kurdish political party, the H.D.P., which was expanding beyond its base to appeal to other minorities and even to some liberal Turks. The party’s soft-spoken leader, Selahattin Demirtas, seemed to embody widespread hopes for a new center of gravity that would marginalize Ocalan and the militant P.K.K. leaders in the Qandil Mountains of northern Iraq. He spoke of a more pluralist Turkey, with greater local control within the Kurdish areas in exchange for a reconciliation with the Turkish state. This vision was very popular with ordinary Kurds, which made the H.D.P. a real political threat to Erdogan. To outflank it, he would need to tackle the Kurdish issue himself — and get credit for it. With all this in mind, Erdogan gave his blessing in mid-2014 to an unlikely series of meetings on the prison island of Imrali. Every few weeks, Ocalan sat at a table with H.D.P. leaders and members of Turkey’s intelligence ministry, discussing the terms of a P.K.K. disarmament. Hatip Dicle, a Kurdish political figure who participated, told me that the meetings helped to build trust. Several times, the parties relayed grievances about government arrests or unwelcome P.K.K. moves, and they were sent back down the chain and resolved, Dicle said. But that triumph was stillborn. 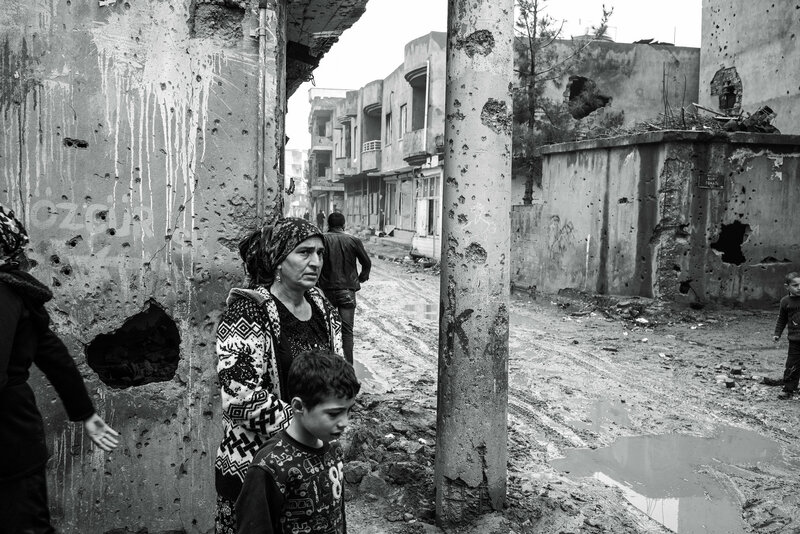 Before the battle of Kobani became a high point of Kurdish pride, it began sowing mistrust. Weeks before their troops were allowed to join the fighting, the Kurds watched with outrage as Erdogan breezily predicted an ISIS victory in Kobani and refused to allow Turkish Kurds to cross to the rescue. There were protests across the southeast, and young P.K.K. members began building barricades; the police responded with force, shooting and killing dozens of protesters. Only weeks later and under heavy international pressure did Erdogan allow the Iraqi Kurdish convoy to pass through and join the battle. As Kobani fueled a wider sense of Kurdish empowerment, Erdogan appears to have concluded that he was being played for a fool. Within weeks of the news conference, he began distancing himself from the peace talks. He declared that “there is no Kurdish problem” and ultimately denied that he’d even known what his deputies were doing. All dialogue was dropped, and the government took away Ocalan’s ability to communicate with the outside world. The P.K.K. began making menacing noises. In July, amid mutual recriminations, P.K.K. militants killed two police officers in the town of Sanliurfa. Young Kurdish militants began rebuilding their barricades across the southeast, and this time, they were armed. The P.K.K. and the Turkish state seem to have jointly stumbled back into war, like an old couple who cannot let go of their quarrels. “We did not think at first of barricades,” Aydin told me. “We thought at first of a revolution among ordinary people, based on the demand for self-administration. For all their talk of victimhood, the young radicals have become adept at waging guerrilla war. Almost 500 Turkish police officers and soldiers have been killed since the cease-fire ended, many by snipers. The streets around the Nusaybin “liberated zone” were planted with roadside bombs, I was later told, to be used in case of a Turkish assault. Two days after my first visit there, a car bomb exploded outside a police building a few hundred yards away, killing two officers and wounding dozens of civilians. After we’d finished talking, Aydin led me out into the bright spring sunshine. I heard a high voice shouting orders. In the vacant lot, about two dozen women dressed in combat fatigues and balaclava-style head coverings were doing an exhibition drill, their boots crunching the ground in unison as they swung their rifles up, across their shoulders and down. A row of female commanders stood at attention in front of them. It was International Women’s Day, an opportunity for women to showcase their powerful role in the movement. One paradox of the P.K.K. is its blend of ardent feminism and cultish devotion to Ocalan. Many women are escaping difficult homes. They credit Ocalan with elevating Kurdish women from a traditional life, in which honor killings were common, to a position of power and respect. A number of women in the movement told me that their first experience handling weapons was revelatory. One who fought as a sniper in Kobani described the moment when she killed her first man, an ISIS fighter: “I felt as if fire were streaming from my eyes,” she said. I had expected some expression of remorse or unease, but instead her face glowed with a kind of exaltation as she said the words. Most of the women that day carried AK-47s, but one had a Russian-made sniper rifle, and I glimpsed a rocket-propelled grenade launcher off to the side. Several dozen children and older women sat near a wall, watching. At one point, a commander held out a sheet of paper and read a statement aloud in a strident voice. “In the spirit of our martyrs, we will fight harder in our self-administered areas. We will not forget our comrades murdered in Cizre.” She continued: “We invite all the women of Kurdistan to fight behind the barricades.” Aydin leaned over and told me that women made up about half the fighters in Nusaybin. When the military maneuvers were over, the women put away their guns and formed lines to do a traditional folk dance, their voices sailing over the empty streets in trilling ululations. Some of the civilian women had dressed up in bright, sequiny gowns for the occasion, and joined the dance. A tinny P.A. system blasted P.K.K. anthems, including one about Rojava — the new Kurdish statelet in Syria — and the battle of Kobani. There were frequent choruses of allegiance to “Apo,” the Kurdish word for uncle, Ocalan’s nickname. From where we stood, the border was only a few hundred meters to the south. From the rooftops around us, you could easily see the grain silos and watchtowers of Qamishli, the new capital of Rojava, where Ocalan’s portrait hangs almost everywhere. It struck me that if the Turkish military waged full-scale war here, it would be like the battle of Kobani in reverse. The Syrian Kurds — many of them cousins of those in Nusaybin — would be sorely tempted to come to their aid. The rebels I spoke to claimed to be the voice of a colonized and dispossessed people. But after nine months of war, many middle-class Turkish Kurds say the P.K.K.’s decision to take on the state was madness. In Diyarbakir’s historic Sur district, the fighting has destroyed a shopping and small-business hub that was the heart of the city’s economy. Thousands of jobs have been lost, and investors who flocked to the city during the cease-fire — when new hotels were being built — have fled. Even in Cizre and other bastions of P.K.K. support, many people quietly admit that they blame the insurgents. Within the movement, the violence has clearly radicalized many young people. But there, too, I heard some quiet but telling voices of dissent. One of them was a 24-year-old woman, a battle-tested P.K.K. sniper whose commitment to the group was beyond question. She grew up in Silvan, another movement stronghold, to a family crowded with P.K.K. members and martyrs. She had not planned to join the organization herself, but as a university student in western Turkey, she grew resentful that the university authorities treated her and other Kurds as potential criminals. She began reading Ocalan’s writings, and his ideas — especially about women’s empowerment — won her over. She did her military and political training in the Qandil Mountains. 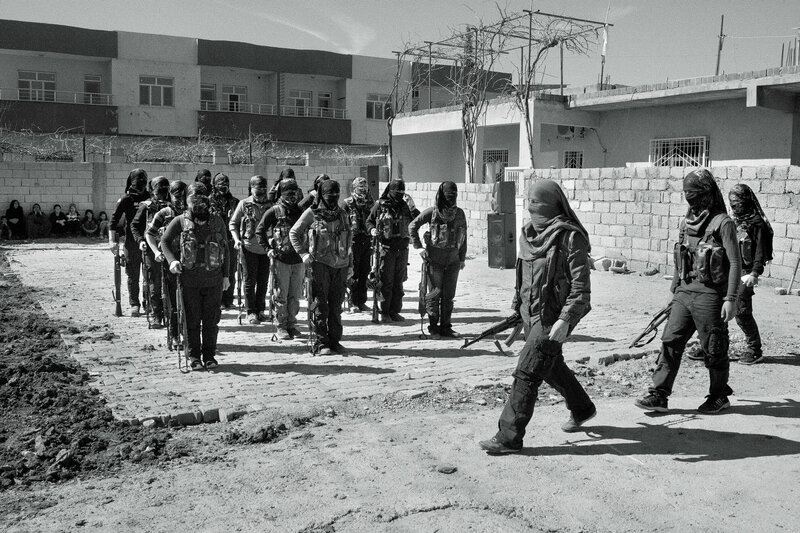 Before it was over, the ISIS assault on Kobani began, and she and another new recruit joined. She fought inside Kobani for more than a month, often coming so close to ISIS fighters that she could see their faces. She carried one grenade on each hip: one to use against the enemy, one to blow herself up in case of capture. Several of her comrades used their grenades this way, she said. The Kurds lost huge numbers of people. In her 25-person unit, only three survived. She described carrying away the remains of friends who were eviscerated by a suicide truck bomb. “You don’t have time to have emotions,” she said. “You go back to your fighter mood.” In November, she was injured in the back by a collapsing barricade and was taken to the mountains for surgery. I asked her whether she had been tempted to join the P.K.K.’s struggle in Turkey, behind the barricades. She was living in Mardin at the time, a short drive from Nusaybin. She said no. Then she was silent for almost a full minute, her open face suddenly full of unease. Her feelings echo those of many other war-weary Kurds, who watched in dismay last summer as Turkey’s politics congealed once again into hostile camps. All hopes for a middle ground vanished. I saw this drama being enacted at some of the P.K.K. funerals I attended in March, where H.D.P. politicians seemed desperate to shore up their base. After my last visit to Nusaybin, an activist invited me to attend the funeral of a veteran P.K.K. commando, who was killed the night before in a gun battle with Turkish soldiers. We had to drive for 20 minutes along narrow country roads to get to her village, a cluster of stone houses overlooking a magnificent landscape of rolling hills and olive trees. Several guests told me the village was a celebrated center of P.K.K. support, with many local martyrs. As we arrived, we could see images of the dead fighter’s face — lean and ascetic, with short dark hair — being held aloft on posters; relatives also handed out stamp-size pictures for guests to pin on their lapels. Her name was Jiyan Konak, and relatives told me she spent 22 years as a fighter. We waited alongside geese, turkeys and clucking chickens until a coffin draped in a flag emerged from her parents’ house, with scores of women ululating and holding up the victory sign with their fingers. At least half a dozen local officials and members of Parliament, all from the H.D.P., were there. When the ceremony began, the relatives and elders gave short, simple speeches. The H.D.P. members delivered long, fierce tirades against the “horrific enemy” — the Turkish government — that killed Konak. One of them, a middle-aged female lawmaker in an elegant gray patterned blazer and scarf, spoke longer than anyone else. “Kobani did not fall, and northern Kurdistan will triumph, too,” she said, her voice rising almost to a shriek as she neared her conclusion. “The Kurdish woman will triumph soon. Leader Apo will triumph soon. She was not the first martyr, and she won’t be the last. At the same time, Erdogan has led a crackdown on the press, with the state jailing critical journalists and academics en masse and closing down opposition outlets; scarcely any remain. He has urged Parliament to “redefine” terrorism in a way that is ominously broad. “The fact that their title is lawmaker, academic, writer, journalist or head of a civil society group doesn’t change the fact that that individual is a terrorist,” he said in March. Even in Erdogan’s own party, total loyalty to the president has become a condition of survival. Prime Minister Ahmet Davutoglu, long viewed as a flunky, was forced out unceremoniously in early May after some mild gestures of difference with Erdogan, including on the Kurdish issue; he had hinted at a return to peace talks. “The one who talks about peace in wartime is as much a traitor as the one who talks about war in peacetime,” wrote an Erdogan ally, in an anonymous denunciation of Davutoglu posted on a blog on May 1. Anyone who tries to reach across the gap becomes a target. One of the country’s few remaining bridge figures was Tahir Elci, a celebrated Kurdish human rights lawyer and president of the Diyarbakir Bar Association. Elci had a long record of taking on the state, but he also publicly criticized the P.K.K., something very few people — including H.D.P. members of Parliament — were willing to do. In the fall, the drumbeat of death threats against Elci rose after he said in a televised interview that he considered the P.K.K. an armed political organization rather than a terrorist group. A month later, facing prosecution for his comments, he appeared at a midday news conference in Diyarbakir, where he called again for an end to the conflict. Moments later, gunfire broke out, and a bullet struck him in the neck. The killing remains unsolved. His funeral drew tens of thousands of mourners. The Turkish government has pledged to rebuild the southeast and to make peace with the Kurds in its own way. So far, that effort does not look promising. I happened to be driving toward Silopi, another town ravaged by war, on the day in March when Prime Minister Davutoglu, then still in government, was visiting. We could see Black Hawk helicopters crisscrossing the sky as we approached, and a long convoy of armored vehicles — part of his security detail — blocked traffic for hours. It was painfully apparent that this remained enemy territory for the Turkish state. Government officials have hinted that they have their own Kurdish intermediaries, and Davutoglu met with some of these during his visit. This is an old Turkish strategy: For decades, the state paid “village guards” to fight the P.K.K., and the Ottomans had their own divide-and-rule strategies. If history is any guide, this will sow more violence without damaging the P.K.K.’s popular legitimacy. The United States may have more leverage. The Paris and Brussels attacks have raised the pressure on President Obama to destroy the ISIS sanctuary in Syria and Iraq, and it is clear that Turkey’s Kurdish conflict is putting this effort at risk by dividing the administration’s two key allies. “What’s concerning is that while Turkey has every right to fight the P.K.K., it’s increasingly becoming a conflict pitting Turkey against the Kurds,” one administration official told me. “That jeopardizes the credibility of even our friends among the Kurds, including Iraqi Kurds.” American officials have tried to keep their Kurdish allies in Syria from unnecessarily provoking the Turks. They say they are not aware of any P.Y.D. fighters or weaponry being transferred north to be used against the Turkish military. The Turks dispute that claim and insist that American weapons sent for use against ISIS have been passed northward and used by the P.K.K. (The shoulder-fired missile shown in the recent online video has prompted widespread speculation about a weapons trail from Syria.) The Obama administration officials I spoke with said they believed that if a peace deal is reached, the Turks will eventually become reconciled to a Kurdish statelet in Syria, just as they agreed to (and even helped midwife) the birth of Iraqi Kurdistan a decade ago. Perhaps. But the Turks say the two situations cannot be compared. In mid-March, the Syrian Kurds took another step toward independence, voting to establish a self-governing federal region. The announcement prompted angry rebuttals from the Turkish and Syrian governments and Arab opposition factions fighting in Syria. Meanwhile, the Americans are trying to find Arab allies who could substitute for the Kurds in a push to conquer Raqqa, the Islamic State’s capital. But they are hobbled by Turkey’s insistence on treating not just the P.Y.D. but also anyone who has worked with it, including Arabs, as terrorists. The fact that Erdogan’s government has itself supported hard-line Islamist militias in Syria — including some with ties to Al Qaeda — only adds to the American frustration. The Obama administration appears to be forging ahead with its plans, despite Turkish complaints: In late April, Obama announced that an additional 250 Special Operations troops were on their way to northeastern Syria to work with the Kurdish-led force there. American officials say they have little choice; the Turks have provided no viable alternatives for an assault on Raqqa. For Erdogan, fighting ISIS remains secondary to ousting President Bashar al-Assad of Syria, whom he blames for the region’s turmoil. Erdogan’s visit to Washington in late March did nothing to address these tensions. The visit was for nuclear-security talks, but Erdogan reportedly lashed out angrily at American policy during an off-the-record dinner with former government officials and academics, and complained repeatedly about the American refusal to treat the P.Y.D. as a terrorist group. During a public speech at the Brookings Institution, his security guards got into a nasty melee outside the building, shoving and shouting at journalists, protesters and Brookings personnel. The guards ordered a prominent Turkish journalist, Amberin Zaman, to leave, calling her a “P.K.K. whore”; security staff members had to stop the guards from removing other journalists from inside the auditorium. In video clips, beefy Turkish guards in dark suits and sunglasses can be seen shouting at pro-Kurdish protesters and being restrained by police officers. Turkey’s Kurdish problem seemed, for a moment, to have spread all the way to Massachusetts Avenue. A few days after my last visit to Nusaybin in March, the authorities announced a new military “curfew,” and thousands of civilians began streaming out of the town. Within days, images began appearing on Twitter of tanks firing into the same buildings where I had sat chatting with young insurgents, and smoke rising from the city. Many of the photographs were taken by sympathetic Syrian Kurds from just over the border in Rojava, where they had a good view of the fighting. The Turkish media reported soldiers killed by bombs and snipers. The activist who had taken me to Nusaybin sent me a set of color sketches she made on her iPad, showing tanks, fighters with guns, bloodied bodies, dead children. One afternoon at the end of March, I received a message from my activist contact in Nusaybin. She had fled the city. There were reports of terrible firefights that day, with tanks blasting buildings into rubble in an effort to recapture the P.K.K. neighborhoods and young rebels struggling to push them back. Omer Aydin, she said, was dead. Robert F. Worth is a contributing writer for the magazine. His book on the legacy of the Arab uprisings, “A Rage for Order,” was published in April by Farrar, Straus & Giroux. Who would buy stocks in this era of central bank lies and deceit? Hedge Funds? Not likely given the appalling low volume. Central Banks are simply scratching each other’s backs is my belief. There are plenty of non-public tools they can use to keep everyone in the dark. And, that’s just where they (administration and the Fed) want you. Since they’re all playing the same game they support each other’s actions. Is their proof? Sure. Japan admits its buying shares; so too is Switzerland and other European central banks. The ECB is buying corporate bonds and they won’t stop at just that and China has been propping their stock markets with no apology. Today’s dreadful economic data, led by the horrific Employment Report was bought, not sold like one would think, was the cherry atop a cake of “bad news is good” nonsense. If you’re going to make a living in markets, you’ll have to accept the current craziness even with the upside down action. For a trend-follower like ourselves either retire or, go with the trends to survive. Market action in the U.S. Friday was a shocker, but markets sagged only slightly. And when the “bad news is good” pimps seized the tape many shorts were squeezed and stocks rallied sharply off their lows. The laughably weak Employment Report fell to only 38K new jobs vs 158K expected with the prior revised from 160K to only a pathetic 123K. And, the BLS didn’t stop there, the Unemployment Rate fell to 4.7% from 4.9%. Further, the participation rate fell once again to 62.6%The disconnect in the numbers from the Treasury to the BLS reveals who’s lying and and/or manipulating numbers. Please, no administration victory parade here. But that’s not all. The International Trade deficit dove to -37B vs prior -35B; PMI Services fell to 51.3 vs prior 52.8; ISM Services fell to 52.9 vs prior 55.5; and Factory Orders were weak remaining flat at 1.9% vs prior 1.7%. It now seems likely the Fed will not raise interest rates at June’s meeting and July’s opportunity is probably off the table. Volume picked up on the selling once again while breadth was mixed. I’ve said all I need to say within the introduction. CAMBRIDGE – Argentina recently emerged from nearly 15 years of the most litigious sovereign default in modern times, if not ever. Now it has the opportunity to reenter the global financial system and build a more stable and prosperous future. It is a chance that the country must be careful not to squander. Argentina’s long absence from international capital markets began in December 2001, when a deep economic crisis brought about the end of the decade-old Convertibility Plan (which fixed the Argentine peso to the US dollar) and ushered in what turned out to be a year-long banking holiday known as the Corralito. By 2005, a resolution to the debt crisis appeared to be at hand. But a number of factors complicated negotiations. For one thing, the debts were enormous, amounting to over $100 billion (including accrued interest payments); indeed, Argentina’s was the largest external default on record until Greece’s recent restructuring. For another, the debt was highly complex, involving 152 types of bonds, six currencies, and eight jurisdictions. But the biggest problem Argentina faced was creditors’ unwillingness to accept the proposed debt exchange. With almost a quarter of holdout creditors refusing haircuts – a large share, compared to other sovereign-debt negotiations – Argentina’s options were severely constrained. Unsurprisingly, another debt exchange was needed in 2010. Then, in 2014, US Federal Court Judge Thomas P. Griesa decided in favor of the holdouts (largely so-called vulture funds), ruling that they had not received equal treatment and thus that Argentina could not make payments on its restructured debt until it paid the holdouts. This spurred a new wave of tense – and ultimately failed – negotiations with holdout creditors. On July 30, 2014, Argentina defaulted on its debt for the second time in 13 years. Finally, last February, Griesa agreed to drop the injunctions, if Argentina repealed laws barring payment of its defaulted debt and paid off bondholders who settled by the end of that month. With the new government coming to terms with the holdouts, Argentina’s time in default is coming to an end, and the country will soon be free – or so it would seem. In fact, the endgame will not be simple. For starters, while it is not possible to measure precisely the economic and social costs of dealing with the holdouts, it is safe to say that they were substantial. And those costs are not entirely in the past; they will have future consequences, given that much of the new debt accrued in 2016 was actually refinanced old debt. Moreover, with international creditors ready and willing to recommence lending to Argentina, it is critical that the country remain vigilant about taking on new external debt. The long and costly process that Argentina is now escaping should convince current and future governments of the need to be wary of the perils of external borrowing. And yet this is not even the first time that a bout of external borrowing has ended badly for the country. It certainly won’t be international creditors that impose limits on Argentina (at least for now). With fixed-income assets offering low and even negative nominal returns – 70% of advanced-economy debt now trades at negative nominal interest rates – and real returns even lower, Argentina’s offerings, with US dollar returns that are 7% or higher, are very tempting. From Argentina’s perspective, renewed access to international capital markets was worth the cost of settling with the holdouts. For years, Argentina’s government has been financing deficits with the printing press, resulting in high inflation, now above 30%. Conventional debt financing will provide a path to inflation stabilization. It will also enable Argentina to address the pent-up need – owing to the country’s long external-financing hiatus – to upgrade basic infrastructure. But, while Argentina’s government clearly needs to borrow, it could go too far – not least because provincial governments are also eager to borrow. Apart from the central government, about half of Argentina’s 24 provinces (counting Buenos Aires) are actively seeking to borrow abroad; some estimates suggest that imminent provincial borrowing could amount to another $5 billion of external debt. This trend would be less worrisome if provincial finances were sound and growth prospects robust. That is not the case. Already, at least ten of Argentina’s provinces face some kind of economic crisis. Given the key role that provincial excesses played in the crisis from which the country just escaped (a role similar to the one they played in the worst financial panic of the nineteenth century, the Baring Crisis of 1890), none of this should be taken lightly. As if Argentina’s government did not face enough challenges already, it must also confront the unenviable task of restraining the provinces. An old Argentine joke wryly observes that the problem with the country’s debt is not that it is external, but that it is eternal. Because a key to breaking the boom-bust cycle lies in recognizing early the precariousness and fleeting nature of abundant finance, let us hope that the lessons of 2001-2015 are not forgotten. That means resisting the temptation to pile up a costly stock of high-yield debt.